Halloween is one of my favorite food crafting holidays. I wish my kids were still young enough to throw the parties I did when they were in preschool. We had tables filled with festive Halloween treats from all the creative moms in our playgroup. I wish I was blogging back then I would have documented them all. 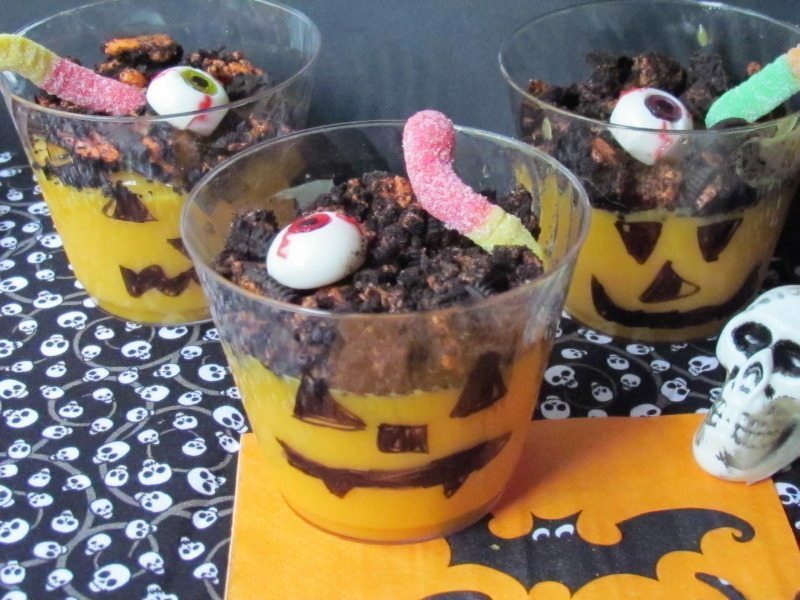 Even though we are not throwing the lunch Halloween party anymore the kids still enjoy Halloween recipes I create especially ones that involve TruMoo. If you don’t have kids don’t stop reading, I have a Halloween Drink Recipe that you can enjoy too. When first given the task to come up with Halloween Recipes using TruMoo Orange Scream, I naturally thought of something with pudding. 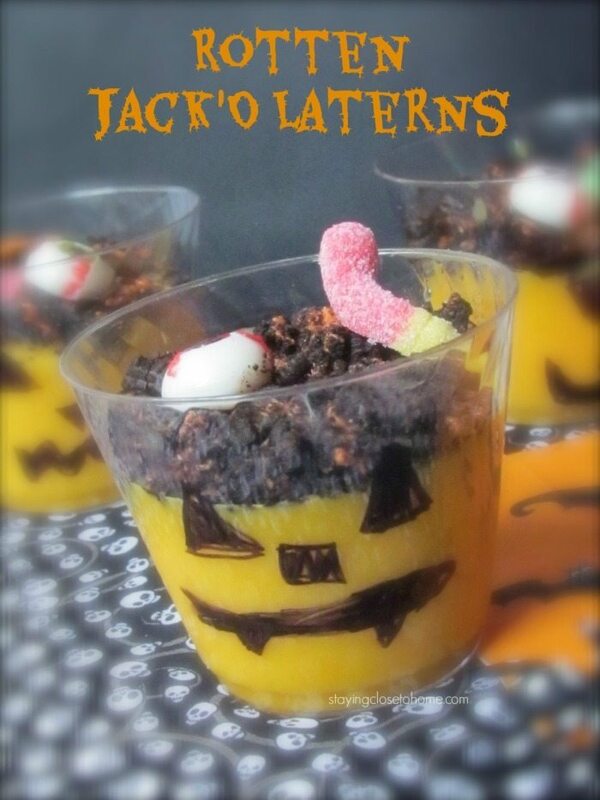 To make this Halloween recipe a little more creepy for my older kids, I thought I would make Rotten Jack-o-Latern cups. 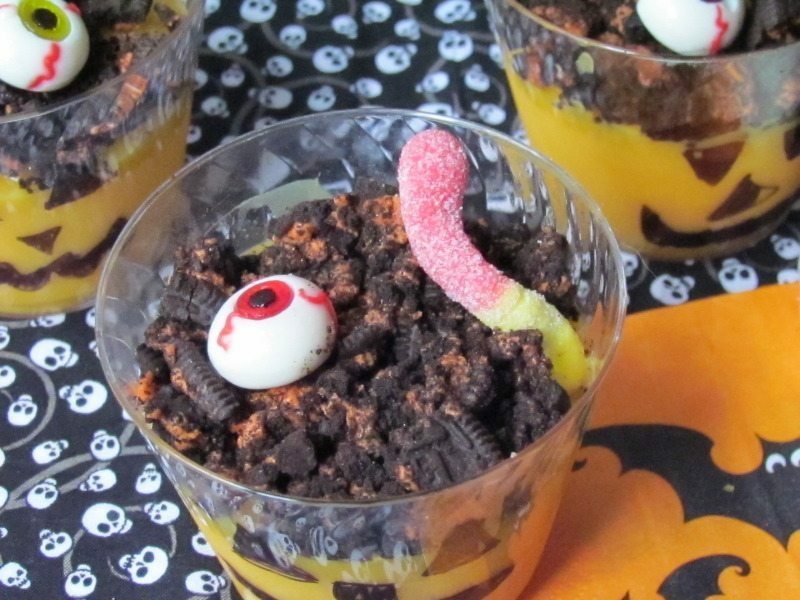 We started with a container of TruMoo, a box of cheesecake pudding, you can use vanilla, Halloween Oreos, and some fun gummy candies. 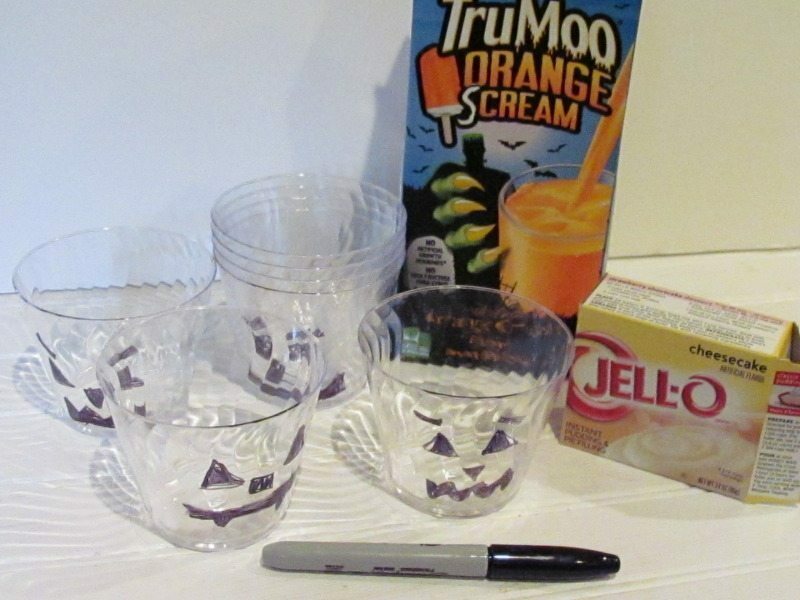 Start by decorating clear plastic cups into jack-o-laterns using a sharpie. Why not get the kids to help out with this too. Make the pudding per the box directions using TruMoo Orange Scream for the milk. Fill each cup about 2/3 full. (about 3/4 cup of pudding) If using smaller glasses you should be able to make four 1/2 cup servings. Allow the pudding to set and then it is decoration time. Cover with smashed up Oreo’s, I liked the Halloween ones since they had the orange filling to resemble spoiled pumpkin. Add some gummy worms and fun gummy eyeballs and you are set. Serve these to your kids, no matter what the age, and they are sure to enjoy the orange flavored pudding that comes from using the TruMoo Orange Scream milk. Parents don’t fret I thought of us too. 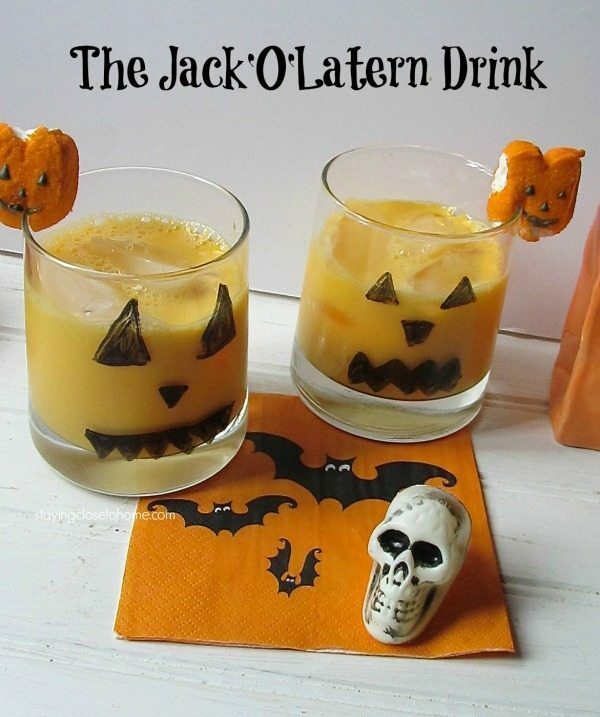 This Halloween, we will be serving these Jack-O-latern drinks to our guests for a fun way to enjoy TruMoo on the rocks. First using a expo marker or black duck tape decorate the glasses to look like carved pumpkins. Fill with ice, and then fill with TruMoo Orange Scream for a cold drink. 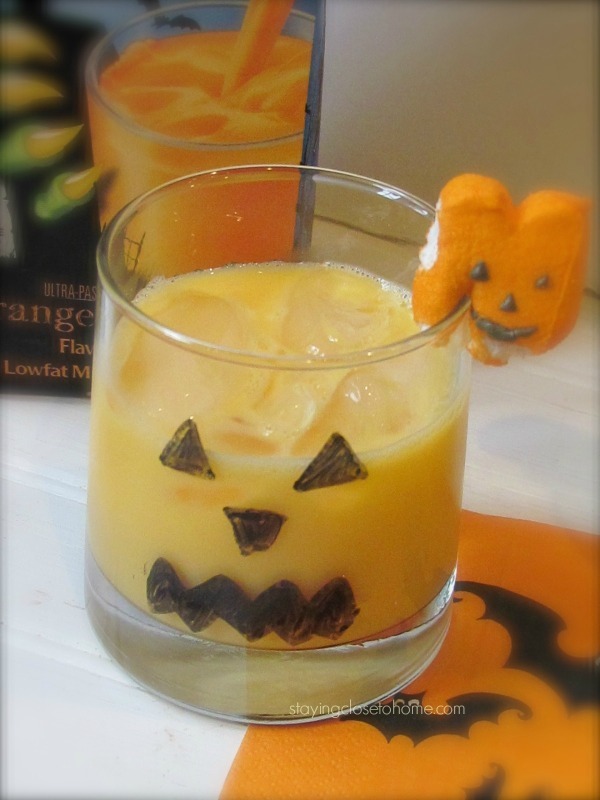 Enjoy these Halloween Recipes using TruMoo you are sure to put a smile on someone’s face! Be sure to visit their website for more delicious TruMoo Halloween recipes as well as Pinterest and TruMoo’s Facebook page. I love how you drew on those cups. Such a super easy way to get a spooky effect. That looks like such a cute treat! We just might make them this weekend! Love these ideas! We’ve never tried Tru Moo. My boys would love either one of these. We are having a Halloween themed birthday party for my youngest and these would be great. Orange Scream Milk sounds great! I am loving the fun recipes. These look like really nice recipes that kids will enjoy all year long. I’ll now go and pick up a Trumoo. My boys love Trumoo. Now this is something that I can definitely make for them. I went to buy this for my kids today and the store did not have it, I will have to check elsewhere. I am sure my kids would love this. Those rotten jack o’lanterns are adorable and creepy and yummy looking! What a fun looking snack for kids! My boys would LOVE these! These are fantastic. Looks like a great snack for all ages. These are so cute. I love the added eyeball. So fun for kids of all ages.